As the dean of the Graduate School of Arts and Sciences and the College of Arts and Sciences of the University of Tokyo, I would like to welcome, with the greatest enthusiasm, each one of you who has just joined our Komaba community. Our community, like any other community, is united by its members’ sense of belonging to the community. Let us call this sense of belonging our Komaba-jin identity. At the core of this identity lies our shared commitment to the cultivation of knowledge beyond the domain of any specific academic field. “Interdisciplinary or integrated knowledge,” so to speak, is indeed at the top of our organizational agenda. 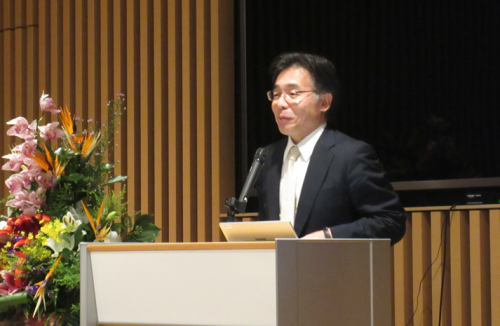 Though I have no intention to claim that every Komaba-jin, that is, each one of us within the Komaba community, would feel and think in exactly the same way about everything on this campus, I am full of confidence that we are very serious about the cultivation of knowledge. In my view, we give our highest priority to the cultivation of knowledge because we believe that broad and balanced perspectives as well as deep and reliable knowledge would not only enable our students to lead intellectually fulfilling and focused personal lives but also equip them to contribute their cultivated knowledge to reconciling seemingly incompatible needs in human society at the local, national, regional and even global levels. Those common agenda of global relevance would include, but would not be limited to, the dilemma of sustainable development and the dilemma of securing minority rights under majoritarian self-rule. In the case of sustainable development, it is no easy task to meet the social needs of economic development and environmental protection simultaneously. And in the case of self-rule, majoritarian self-determination within a given territory often threatens the security of minority rights. No doubt reconciling these seemingly incompatible needs is an intellectually demanding task. And there are certainly many more challenges facing human society in the world. Find one of your own. Your own intellectual struggle for a solution will be a satisfying and rewarding experience, one you will certainly have before you leave this campus as a true Komaba-jin. It is in this context that our PEAK/GPEAK programs come into the picture. In October 2012, the University of Tokyo took a major step in our 140-year history when we established the Programs in English at Komaba, our first undergraduate degree program conducted in a language other than Japanese. In other words, those admitted students, to whom the University opened its heavy door, receive most or all of their education in a non-Japanese language. Our PEAK/GPEAK programs will provide you with the essential tools you need to tackle the common agenda of global relevance I just referred to: first, an integrated understanding of the world’s complex reality with full awareness of competing and complementing academic viewpoints, in other words, an interdisciplinary mindset; second, logically consistent reasoning and evidence-based analytical methods that equip you with real scientific persuasiveness; third, the multicultural unbiased imagination and historically-informed viewpoint necessary to deeply and fully comprehend the many problems facing human societies across the globe; and finally, the global communication abilities that are indispensable when articulating your own original thoughts on universal problems. While PEAK/GPEAK are small programs that select only a small group of undergraduate and graduate students each year, for this very reason these programs are indeed some of our university’s most important endeavors.